Welcome to one of Highland Park’s most coveted streets, right next to trendy York Blvd and Occidental College. This re-envisioned craftsman has all of yesterday’s charm combined with today’s modern conveniences. The open flow from the living room to the dining room and kitchen offers a seamless living space. The kitchen boasts walnut butcher block countertops and stainless steel appliances. Both bathrooms have been completely redesigned with spa-like amenities, including a freestanding soaking tub and walk-in shower. In addition to the 2 bedrooms, the home has a bonus room, perfect for an office or nursery. The patio in the back overlooks the oversized grassy area, complete with avocado and citrus trees. The backyard also features a finished garage and 2 separate storage spaces-one ideal for a work/storage space and one underground wine cellar/storage area to be creatively used as you please. Additional upgrades include AC, a new concrete driveway, and beautiful drought-tolerant landscaping. Your LA oasis awaits! Beautifully remodeled 3 bed/2.5 bath townhome with high-end contemporary finishes in the heart of Gardena, the ‘City of Opportunity’. Upon entry, the spacious living room greets you with natural light, new flooring, and a wood-burning fireplace with custom wood mantel. The kitchen features new flat-panel cabinets, white quartz countertops and coordinating backsplash, as well as stainless steel appliances. Overlooking the balcony, the dining room seamlessly connects the kitchen and living room, perfect for entertaining. Rounding out the main level is the powder room with floating shelves and basket-weave mosaic tile flooring. All bedrooms upstairs, including the master suite with vaulted ceiling and spa-like ensuite bathroom. The other upstairs bathroom features floor-to-ceiling stacked stone and custom quartz vanity. Come see it today – this is a 5-star townhome that won’t last long. Welcome to one of the newest remodels on the hill. Nestled in the picturesque neighborhood off Hawthorne and Abbottswood, this home is sure to impress with it’s flowing floor plan and designer finishes. Enjoy the “peek-a-boo plus” views from the kitchen, dining room, front bedrooms and backyard. The designer kitchen boasts granite counters, stainless steel appliances, and an island/bar combo – all perfect for entertaining. Both bathrooms have been completely remodeled, including the transitional master ensuite bath. The spacious living room, full of natural light, features a brick fireplace with custom-wood mantle and opens to the private backyard. The open backyard features new sprinklers and sod, as well as 4 fruit trees, appealing to both family fun and entertaining. Other upgrades include new flooring, vinyl windows, roof, electrical, forced-air heating, garage door, to name a few. Come see this impressive property soon! This is your opportunity to enjoy life in a newly remodeled 2-level townhome. The open layout of the first floor provides functionality & seamlessness to the living room, dining room, and kitchen – Perfect for entertaining! The updated kitchen, featuring granite countertops & new stainless steel appliances, overlooks the charming patio with citrus trees. Upstairs, you will find 3 bedrooms, including the master suite complete with a private balcony and luxury-styled bathroom. The en-suite master bathroom is sure to impress with the quartz double vanity & spa-like shower. Situated in a small complex with an attached garage, this end-unit has new carpet and paint, as well as decorator-quality fixtures. Come see it before it’s gone! 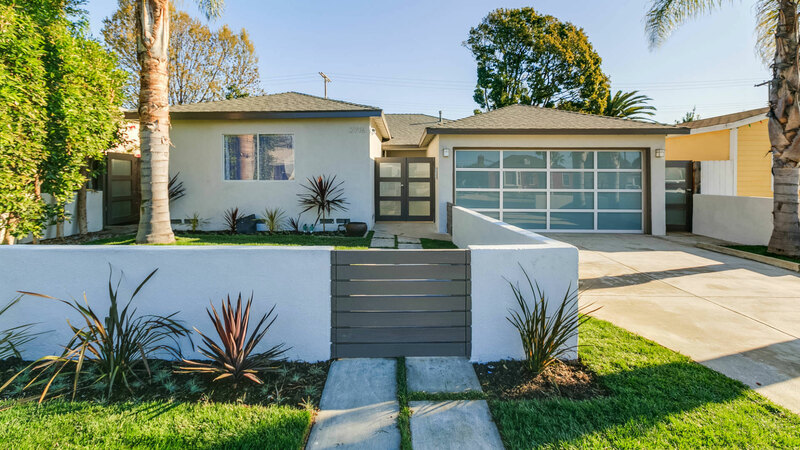 Come see this beautifully renovated home in one of Hawthorne’s hottest neighborhoods. Remodeled kitchen features travertine flooring, granite countertops, and stainless steel appliances. Natural light fills the kitchen, living room, and dining area. The updated bathrooms are finished with spa-like travertine flooring and showers. New oil-rubbed bronze door hardware and lighting throughout, including ceiling fans in all bedrooms. Bonus room, which is spacious enough to be a bedroom, leads out to the extra-large grassy backyard, perfect for outdoor entertaining. Property features a sprinkler system in both the front and back yards. Don’t wait, come see it before it’s gone! Make sure you see this beautifully renovated 4-bedroom home. Fully remodeled in 2014, there is a new roof, engineered wood flooring and contemporary gray carpeting throughout this home. The traditional yet open floor plan brings flow to the living room, dining room and kitchen. The remodeled kitchen includes granite countertops and stainless steel appliances. The hall bathroom has subway-tiled shower and a large 60″ vanity. Master ensuite bathroom has newer vanity and brushed nickel fixtures. There are dual-paned windows, including a sliding-glass door from the dining area to the private backyard, perfect for outdoor entertaining. The mature landscaping features a sprinkler system in both the front and back yards. To round it all out, the side yard has a citrus tree and concord grape vines. Take advantage while interest rates are low! This turn-key condo won’t last long. Quiet first floor end-unit is conveniently located near laundry. Condo has upgrades throughout including richly-colored wood flooring in the living room and bedroom. Granite kitchen complete with new dishwasher, faucet, cabinet hardware, and brushed nickel lighting. Open layout seamlessly connects the kitchen and living room for easy entertaining. Secure gated complex with inviting pool and BBQ area, perfect for relaxing evenings. This condo is a must see! Make sure you see this beautifully renovated 4-bedroom home. Fully remodeled in 2013, there is engineered wood flooring throughout this beautiful home. Completely remodeled granite kitchen with stainless steel appliances. Bathrooms have newer tile and vanities. Dual-glazed windows, including a sliding-glass door from the living room to the extra-large grassy backyard. Charming brick fireplace in the open living room. All the bedrooms feature unique pitched ceilings with beams. Garage has commercial-sized doors in both the front and back, giving thru-access for RV parking. Well-kept landscaping featuring a sprinkler system in both the front and back yards. Take advantage while interest rates are low! This adorable cape cod style condo won’t last long. Quiet first floor end-unit conveniently located near pool. Condo has been upgraded throughout including both master suites, each with their own private bathrooms. Kitchen complete with contemporary flat-panel cabinets, butchers block counters, and recessed lighting. Open layout seamlessly connects the kitchen and living room for easy entertaining. Through a sliding glass door, the dining area leads out to a private patio enclosed by a brand new vinyl fence. Patio has new wood chips and established orange tree. Newer AC system. Washer and dryer in unit. Secure gated complex. This condo is a must see! If you’ve been looking for a 2015-updated home with clean lines and modern sophistication, look no further. Located on the border of Mt. Washington and Glassell Park, this exquisite home is perfect for both entertaining and for enjoying quiet time. The secluded and quiet backyard gives you the opportunity for either one at any time. The open floor plan of the main level brings seamless flow through the living room, dining room and kitchen. Lava stone kitchen counters are striking against the glass backsplash and brand new white cabinetry. Follow the richly colored floors upstairs to 3 generously-sized bedrooms. Each of the 3 bathrooms has it’s own unique feel and each of them could carry their own in a design magazine. The master suite, complete with walk-in closet, leads out to a tranquil backyard with drought-friendly turf. This ultra-hip, reimagined home also features new dual-paned windows, as well as a new HVAC unit. Don’t wait on this one, it will go quickly. You’ll love this charming Coastal-Traditional home with spectacular valley views. This 3 bedroom, 2 bathroom home, featuring a 2-car garage, provides over 1,300 square feet of generously proportioned living space. The home is open and spacious, yet comfortable and inviting. Picture this, prepare a delicious dinner in your completely upgraded kitchen or outside on the deck, enjoying the ocean air, then watch a movie, next to the earthy stacked stone fireplace, all while enjoying the beautiful south-facing panoramic views. New dual-paned windows and sliding doors provide the beginning of the upgrade list. Next, there is new flooring throughout. The kitchen has soft white, brown and blue hues that are stylish and warm, not to mention the new stainless steel appliances. The master suite is spacious and includes it’s own glass and ceramic tile shower and espresso-stained double vanity. Enjoy this beautifully upgraded home, as well as all that San Juan Capistrano has to offer! © 2019 Copyright Shenbaum Group, Inc.